Situated atop the towers of this historic San Juan hotel, the Vanderbilt Penthouse offers breathtaking views of the ocean, the unique coastline, and vibrant cityscape of the Condado area. With space of accommodating up to three rooms for a total of 2,590 sq ft (240.5 sq m), guests have the opportunity to decide how to enjoy lavish comfort. In addition to a lush king-size bed, oversized bath with separate tub and shower, and a chic, custom-made dressing area, the master bedroom boasts a spacious balcony appointed with a comfortable chaise lounge and an armchair with ottoman in a lovely sitting area with spectacular views of the Atlantic Ocean. For added privacy, rooms connect through a vestibule, while extra guestrooms include their own private bathroom and balcony. The expanse of the living room area is ideal to entertain guests be it for a lovely dinner or some drinks. 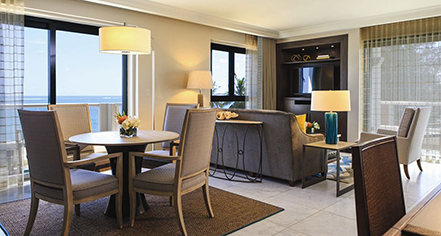 Vistas of the Atlantic Ocean await from the beautiful Commodore Ocean Front One Bedroom Suite. Indulge in the comfort of 815 sq ft (75.5 sq m), which includes a separate sitting and dining area. Boasting a lush king-size bed, separate shower and bathtub, a custom made dark wood dressing area, these spacious accommodations are appointed with balconies off the dining area as well as the master bedroom. Experience true paradise in the One Bedroom Commodore Ocean View Suite, where serene ocean views soothe the senses and city lights adorn the horizon. The 815 sq ft of comfort (75.5 sq m), includes a conveniently separated sitting and dining area, bath with separate shower and bathtub, custom made dark wood dressing area, master bedroom furnished with a lush king-size bed, and two ample balconies to take in the sea breeze. Guests can enjoy breathtaking ocean views as well as city vistas from the private balconies in Biltmore Ocean View One Bedroom Suites. 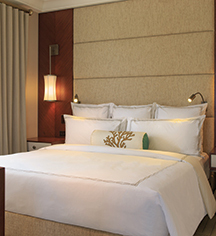 With a space of 650 sq ft (60 sq m), these suites offer the comfort of a fully equipped and separate sitting area. Each suite provides a lush king-size bed, double sinks, integrated shower and bathtub, and a custom made rich wood dressing area. Nestled in the Spanish Revival Building, the Ambassador Ocean Front One Bedroom Suites are designed for the discerning traveler. With a space of 610 sq ft (56.5 sq m), a separate sitting area with wet bar discreetly connects to the bedroom through a small vestibule. Boasting majestic ocean views through wonderfully crafted French windows, each suite is appointed with a lush king-sized bed, custom made dark wood dressing areas, double sinks, shower and a whirlpool bathtub with a view directly towards the ocean. Personalize a San Juan experience with custom-tailored activities planning and other services. Enjoy effortless arrivals and departures with airport pick up and drop off. Allow the professional butlers to unpack and organize your belongings, prepare a full guest agenda and fulfill personal requests - such as restaurant and entertainment reservations.